The original Townie Go! 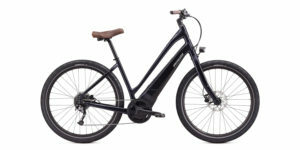 has become one of the most popular mainstream electric bikes to hit the market since it first launched in 2012. Since that time, Electra has upgraded the motor from Bosch Active Cruise to Bosch Performance Cruise (going from 50 Nm to ~60 Newton meters of torque), adding color options, and refining some of the touch points. 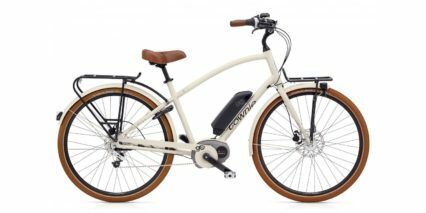 With the introduction of a new Townie Commute Go! 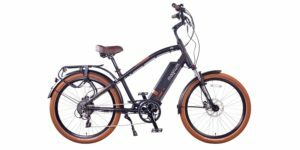 8i model in 2017, many people have wondered what the differences are and why you’d choose the Commute over the original Townie Go! (which is still being sold). 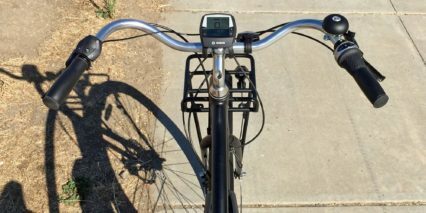 In short, the Commute offers a more upright body position and active ride experience for those who might be pedaling faster and riding further… commuting to work vs. relaxing in a park or neighborhood setting. 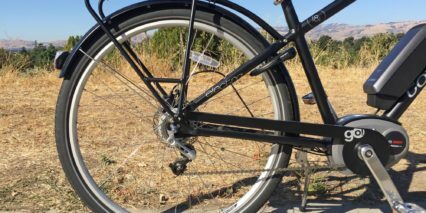 It doesn’t completely shake the cruiser look, and is still one of the most relaxed and comfort oriented cruisers on the market, but the wider wheel diameter (28″ vs. 26″) and less-offset bottom bracket emphasize pedaling. 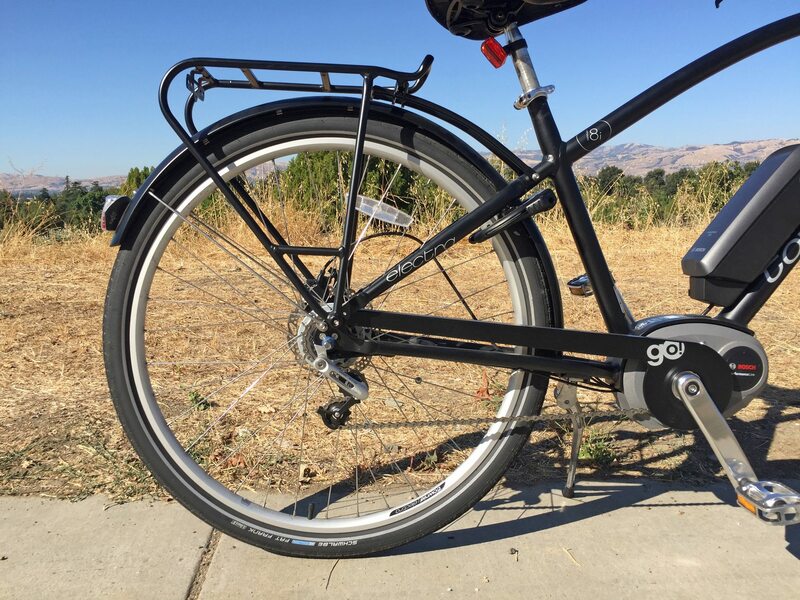 Other technical differences include the use of powerful hydraulic disc brakes, a front rack in addition to the standard rear rack, reflective tires, a single side kickstand vs. a double-legged center stand, a premium paint-matched bell for signaling and a lighter overall footprint. There’s a lot to appreciate with this new model but a few things did confuse me… the front wheel has a dynamo hub built into it (or at least the demo models I tested did), and yet, this dynamo does not appear to be connected to anything. It’s creating drag on the front wheel but the electricity is going nowhere? It probably adds weight and expense, so there must be a reason for it. Perhaps this was included on European models and setup with some different sort of headlight and simply left on the American version to hit economies of scale and reduce manufacturing complexities and variations? The front rack is another area of mixed results for me, it turns as you steer which can change the handling feel or dump supplies off of either side depending on how tight the turns are. 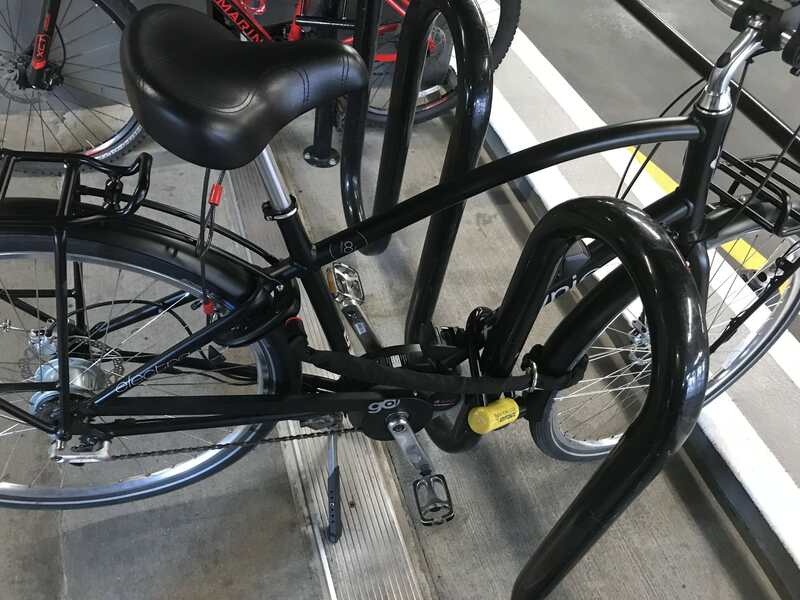 And if you park, because the bike uses a single-side kickstand, the front rack may tip to the left and shift contents. 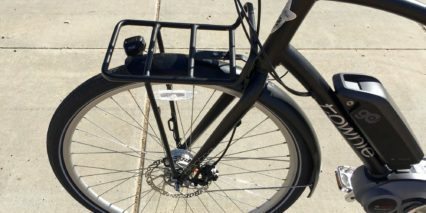 A more sturdy design would be to have the rack mounted to the steerer tube / head tube, but that may cost more and can be a little confusing visually as you steer the bike but see the rack staying straight. It’s all about trade off’s I guess, but one thing they really nailed is the two frame sizes and multiple colors. As an average sized male, standing 5’9″ tall, I would probably get the black step-thru because of how easy it is to mount. It doesn’t look as feminine as the light blue step-thru and handled very well (the frame felt stiff vs. flexy as a lot of other wave designs are). 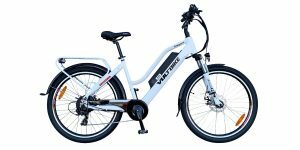 With the motor and battery mounted low and center on the frame, the bikes handled well and left plenty of room for cargo, especially on the rear rack which is not compromised by a rack-mounted battery. 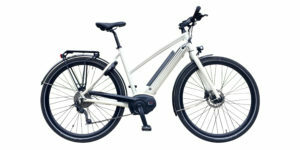 Driving the bike is a standard Bosch Performance Line Cruise motor producing 250 to 500+ watts of power output and up to 63 Newton meters of torque. It’s incredibly capable and super responsive. 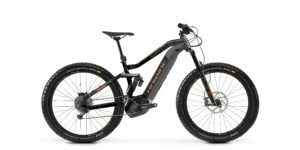 This motor responds to rear wheel speed, pedal cadence, and pedal torque. It listens for these signals 1,000 times per second and spins a smaller 20 tooth sprocket to deliver maximum chain grab and start power. 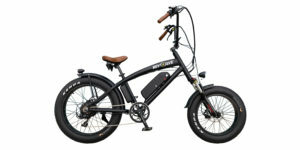 The world of electric bikes has grown a lot over the past five years and there are many cruiser options with throttles and super powerful motors but Bosch, with it’s smart pedal-assist only design, has remained one of my favorites. I have found that it responds quickly and powerfully enough (depending on the gear, and the level of assist you choose) to almost feel like a throttle. It isn’t difficult to start out on a hill from zero if you’re in a lower gear. And that’s easy to accomplish with the Townie Commute Go! 8i because you can shift gears at standstill. The 8i in the name stands for eight speed internally geared. Simply twist the half-grip shifter on the right side of the bar and it will click into the next gear. It works pretty well, but can take some getting used to for those who are more familiar with trigger shifters. 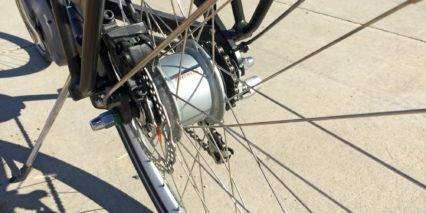 For example, if you shift while applying a lot of pressure on the pedals and cranks, the Shimano Nexus hub may not shift immediately and you’ll hear a clicking sound. This will continue until you ease back just a bit and let the new gear engage. 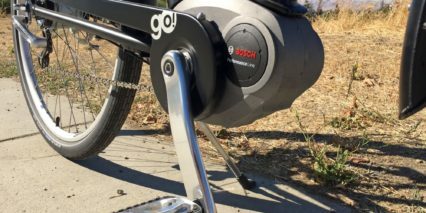 The Bosch mid-motor has a built in micro-gap to help shifting occur naturally, they call this shift detection, but the best thing to do as a rider is ease off slightly if you need the gear to change. The combination of a mid drive with an internally geared hub means there are only two chainrings in use and the chain itself can stay straight and tight. Electra did not opt for a horizontal dropout design here (used to tighten the chain for single sprocket setups like this) and instead is using a chain tensioner that looks a bit like a derailleur. Perhaps this means they will have a cassette version of the bike for less money in the future or maybe they just shared the dropout section of the frame with another model? Whatever the cases, it works fine and chain didn’t bounce or fall off during my tests. 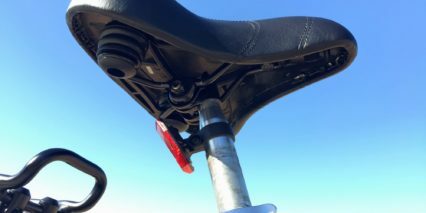 Most of the shifting mechanisms are protected near the hub and should require less maintenance than a standard derailleur. If the bike tips or gets bumped from the right side, the hub is more protected… and your pants or dress will also be protected thanks to a painted chain cover. I love how minimalist this cover is but noticed that it is made from Steel vs. Aluminum which means it could probably rust if scratched. Be careful not to step on the cover or graze it with your right shoe while pedaling. Note also, that internally geared hubs tend to weigh a bit more than derailleurs and sprockets, they also add to the cost. 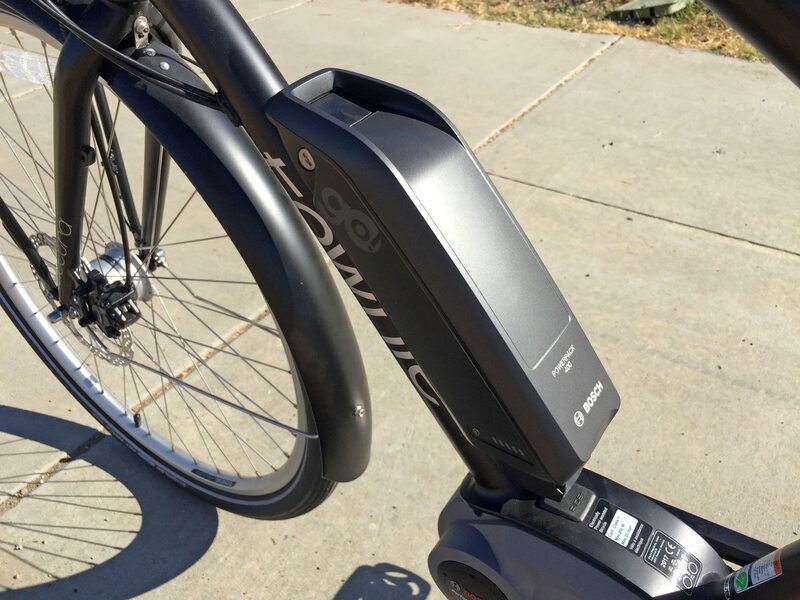 Powering the bike is a standard Bosch Powerpack 400 that is mounted directly to the downtube. 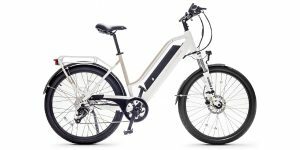 It’s not especially refined or integrated like some of the fancy new e-mountain bikes, many of which also use Bosch, but it doesn’t look that out of place here. 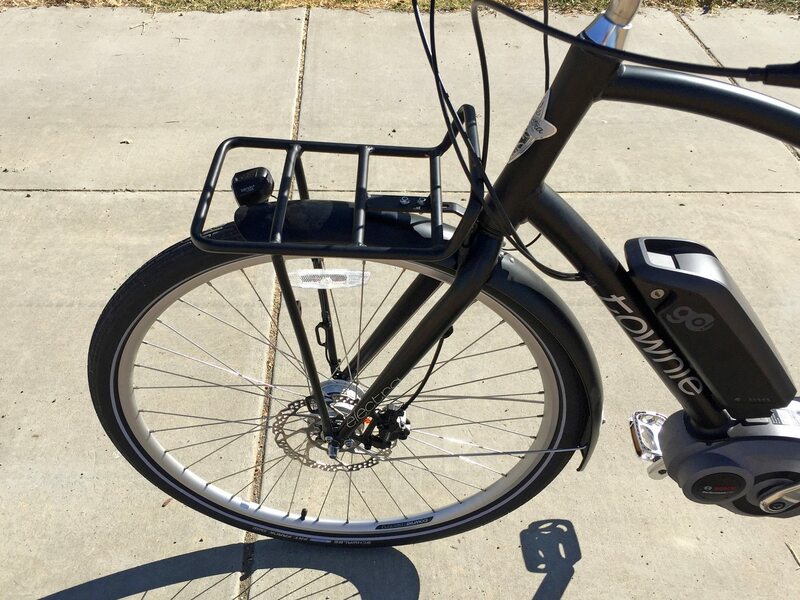 It’s easy to get at for charging or removal and I would definitely recommend taking it off if you have to lift the bike or are storing it in an environment that experiences extreme heat or cold. The battery case has a nice loop at the top to make carrying easier and safer, it has an integrated 5-LED power readout so you can see how full it is without mounting to the bike, and it doesn’t require a special adapter to work with the charger as some other less refined systems sometimes do. The battery charger that you get with the Commute Go! is the more basic Compact version which puts out a standard 2 Amps vs. 4 Amps. But it’s smaller and lighter, it works fine for the Powerpack 400 here. 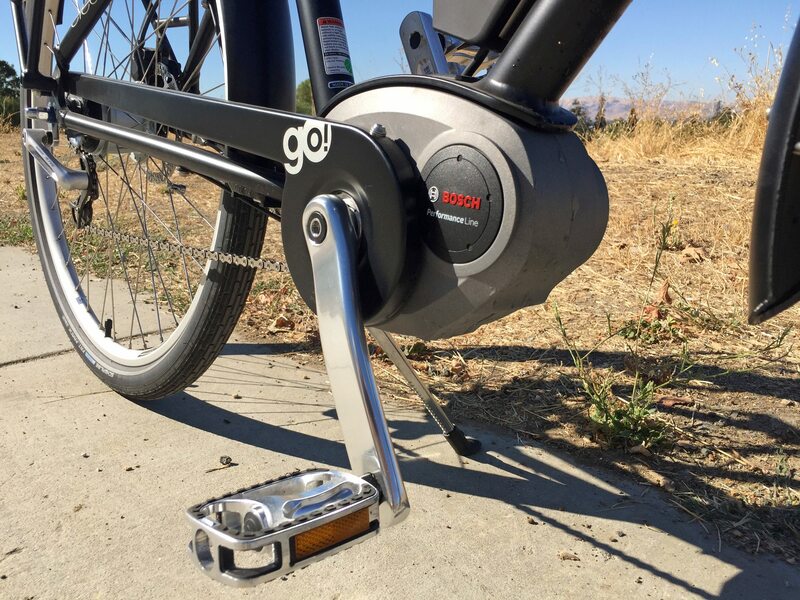 Bosch now offers a larger Powerpack 500 which offers 25% more capacity, and the good news is that you can buy this pack separately and it will work with the same interface on the downtube. Both batteries use the same sort of Lithium-ion chemistry but the Powerpack 500 has a higher energy density makeup in its cells. It doesn’t weigh much more but will increase your range which can be nice. The stock Powerpack 400 should deliver between 20 to 60 miles depending on the level of assist chosen and I love how easy it is to gauge distance using the Bosch Intuvia display panel which has a range menu. 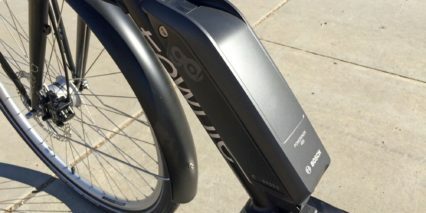 The Intuvia is one of my favorite display systems from any ebike manufacturer because it’s large and easy to read, has a Micro-USB port built into the side, can be navigated with a remote button pad so you don’t have to take your hands off the grips to make adjustments while riding, and it can be remove easily for safe storage. This display isn’t overly complicated, the basic interactions are on, up, and down. You could literally just turn it on and arrow up with + and down with – buttons to achieve the optimal support… or you could go further and press the i button to explore trip readouts such as distance, time, max speed, and that range menu I mentioned earlier. It all works together nicely, and the display is backlit with a faint blue glow for use at night. Since the Townie Commute Go! 8i has integrated LED lights, the display panel is also used to turn them on or off by pressing the lightbulb button at the lower right corner. My own experience with this system has been that it balances function with form but leans a bit more towards function. Bosch now has a Purion display that combines an LCD with buttons and is much smaller and not removable. 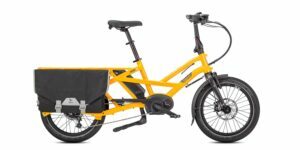 For someone who actually commutes, and might leave their electric bike out in the rain, direct sunlight, or in a rougher bike rack, the removability factor is huge. You can often pay to have shops swap display models if you prefer the smaller, and I did notice that the button pad wire was stretched pretty far to reach all the way to the left grip. It seems like there’s a bit of room for refinement there, but overall the system works very well. I also like that the display mount can be swiveled forward and back (if not over-tightened) to help reduce glare. 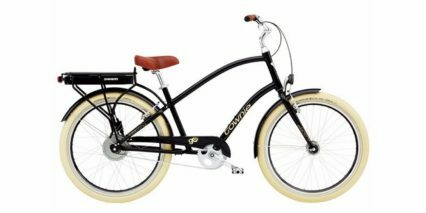 At the end of the day, I think I could be happy on either the original Townie Go! or the new Commute model. The smaller diameter of the Townie Go! 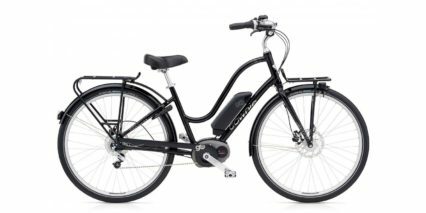 means that the frame is lower to the ground, and it has wider more stable tires… but it does weigh just a bit more and lacks the hydraulic disc brakes that the Commute offers. 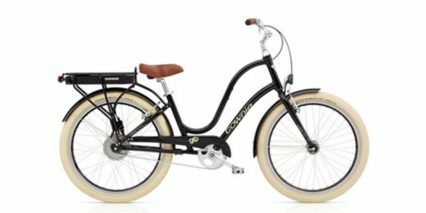 Both bikes will likely receive incremental design and accessory improvements over the years (we have already seen that with the Townie Go!) but one thing that remains great is the wide network of dealers who can help fit you and service the product long term. I want to thank Summit Bicycles in San Jose, California for letting me showcase the Townie Go! and Townie Commute Go! side by side. 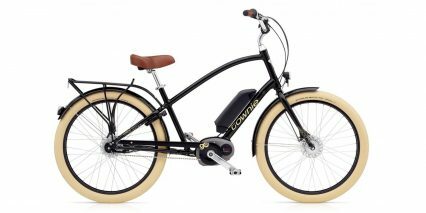 They also sell the non-electric Townie models which cost just $500. It’s a bit jarring to see basically the same bike for $2,500 more because it’s electrified… but the Bosch drive system is worth it if you’re struggling to keep up with a friend, trying to go further, or just don’t want to arrive to work all sweaty. 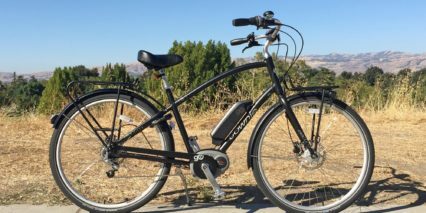 If buying the Townie Go Commute or another electric bike means that you can forego an automobile and save on gas, insurance, and repairs, then the price can make sense. 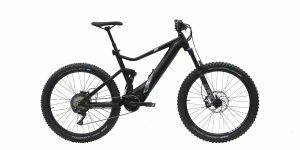 In the world of electric bikes, this would be considered a mid-level price for all of the accessories and dealer support that you get. There are competing products out there which may not last as long or perform as quickly, powerfully, or smoothly. Again, the frame and color options draw me in and I think this could be a great option for many purposes and types of riders. I got my Electra Townie Go Commute about 6 weeks ago. It does not have a front dynamo and the front wheel has quick releases. I love the ride and my only complaint is that they did not key the battery and the cafe lock together. I have to carry three keys, including my chain lock, with me when I ride. 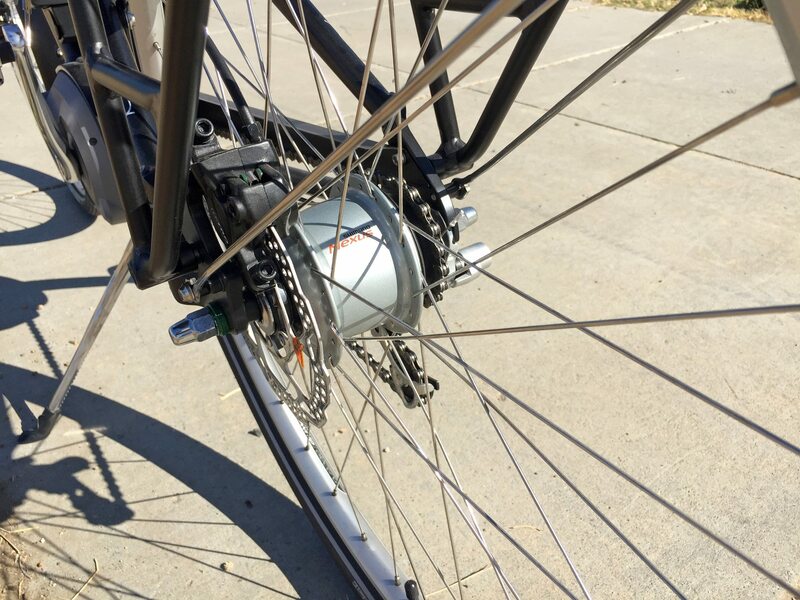 Huh, that’s very interesting… Thanks for chiming in about the dynamo and quick release front wheel. I wonder if the bikes I saw were from a different batch or had different requirements or something? Would you mind sharing which state you bought yours in? I conducted this review in Santa Clara, California (near San Francisco). I bought mine at Santiago Cycling in Tustin, CA, Southern California. Mine is the Stone Grey/White model. 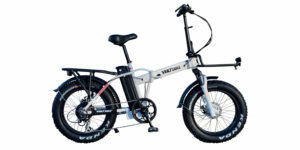 I had wanted the Townie Go high step but Santiago Cycling stated their supplier, and they are a Trek shop, was all out of Townie e-bikes except for the Commute, so that’s what I bought. It sounded like they might have more in September. 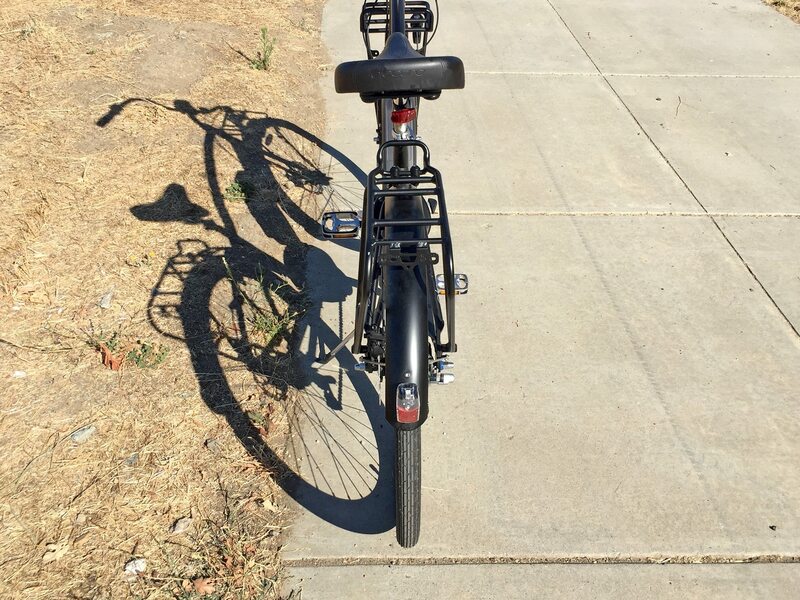 I posted this in response to a reply to my comments on the Trek Super Commuter +7 forum. Since it pertains to the Electra Townie Commute 8i, I thought I would repost it here. 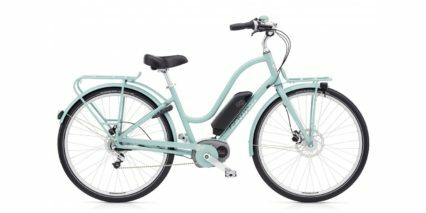 Thanks Court, your reviews helped my wife decide on this ebike. She loves her new white step through 2018 Electra Townie Commute 8i. We have been riding together for the past 12 years on carbon fiber road bikes, with the associated clothing, clipless pedals and etc.. For the past several years she would dread climbing the 12% grade hill leading up to our home from the American River Bike Trail at the end of a ride, especially if the ride was more than 15 miles. She now loves to go out and ride the ebike, and that 12% hill, no problem. 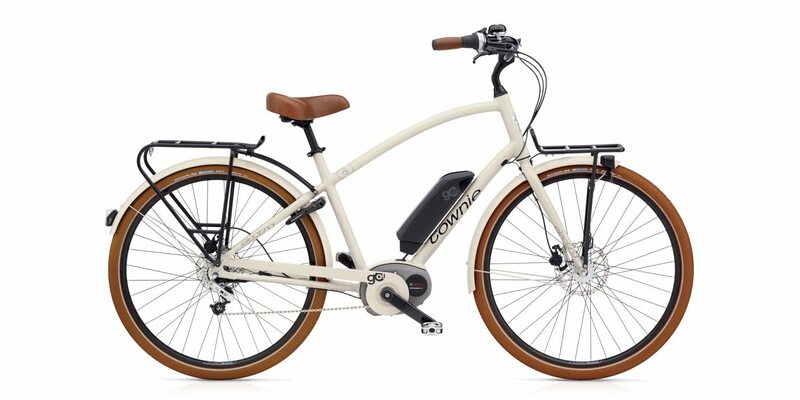 Her Townie Commute is a relaxed geometry step through ebike with a comfortable saddle that she can ride in casual clothing. 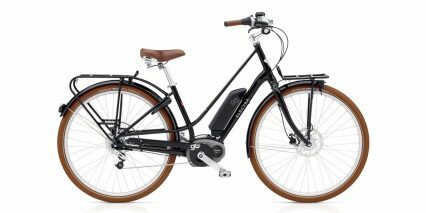 With both my Trek SC +7 and her Townie Commute being class 1 (with pedal assist up to 20mph), we can ride together, at the same pace (the Townie Commute 8i has the same Bosch Performance Line Cruise 63 NM motor, with a 400 watt battery (the SC +7 has the 500 watt battery), and the batteries are interchangeable between both ebikes). We added both a Niterider LED headlight and Solas taillight to her ebike as well. 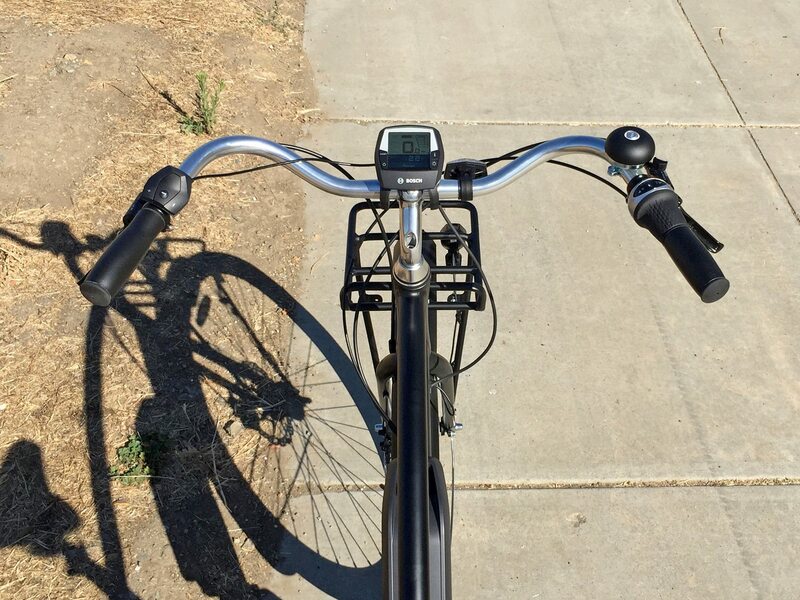 It’s been hot this summer in Sacramento, California, so we have been taking evening rides of 15 miles in the last hour of daylight, when it is cooler. 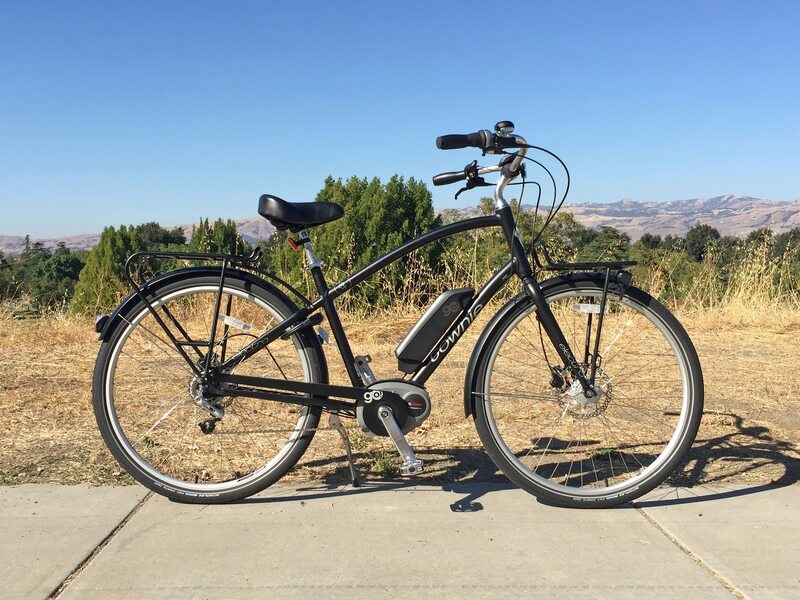 We added a cadence sensor and attached her Garmin 520, we added a handle bar mount water bottle cage and we added the Electra rear wicker baskets, so we can ride about 10 miles each way on the American River Bike Trail to the Historic Folsom Farmers Market on Saturday mornings to buy fruits and veggies. She is loving it. We are both in our mid 60’s and this investment has been a game changer for both of us. Thanks Court. 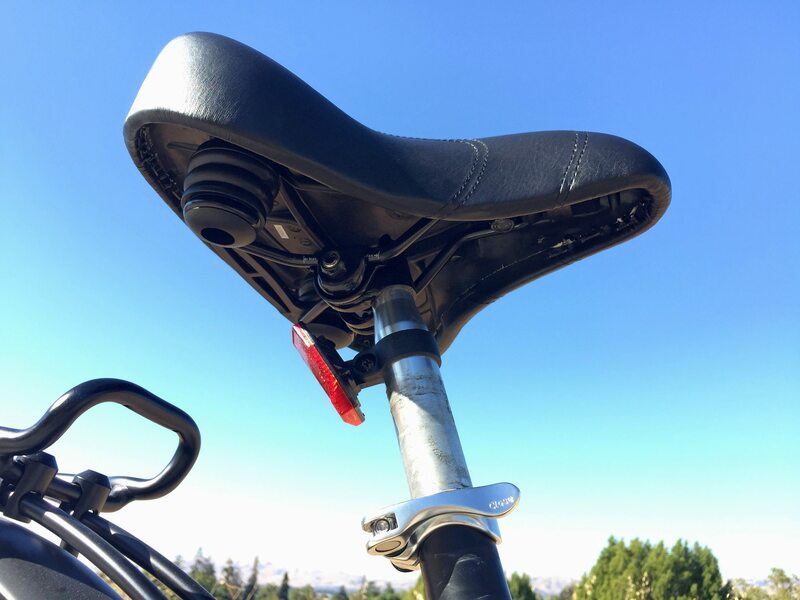 In case anyone was interested, here is the link to the handlbar water bottle cage mount on the official Electra website. I recently purchased this model for commuting 20 miles to work (one way). 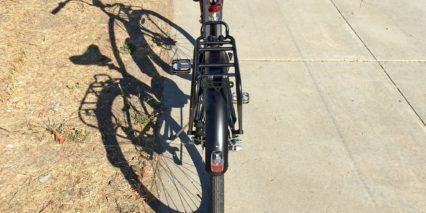 The front wheel came with quick release and no dynamo front hub, also the included kickstand was of the double-legged center variety that regular Townie has. I just wanted to mention that the included ABUS 5650 frame lock does have a port for optional cable or chain accessory, see the photo here. Also, in your video you went over the clicking noise Shimano Nexus 8 speed hub was making, you thought it was because it was protecting itself from too much torque applied. Well, my bike was making the same clicking noise, and easing on the torque did not fix this issue with certain speed selection (mainly 5th speed). There’s very short video that shows how to properly calibrate this hub very quickly without using any tools, once I did that I no longer encountered any clicking, it’s perfect. This is the video link.